The Shifting Legacy Of The Man Who Shot Franz Ferdinand : Parallels Gavrilo Princip helped spark World War I when he assassinated the heir to the Austro-Hungarian throne a hundred years ago. In death, he's been a more potent symbol than he ever was in life. Nineteen-year-old Bosnian Serb Gavrilo Princip fired the shots that killed the heir to the Austro-Hungarian empire, Archduke Franz Ferdinand, and his wife, Sophie, during a visit to Sarajevo on June 28, 1914. Depending on whom you ask, he's either a hero or a terrorist. A hundred years ago Saturday, Gavrilo Princip shot the heir to the Austro-Hungarian throne. That event triggered World War I, charting the course for the 20th century. Today, the legacy of the Bosnian Serb nationalist remains the subject of intense debate — nowhere more than in Sarajevo itself. In the one-room museum on the corner where the assassination took place, tour guide Mirsad Nazerovic points to a black-and-white photo of a pillar that used to stand outside this building. It was a monument with a very short life. "Construction started in 1916. It was finished in 1917. And it was destroyed in 1918," says Nazerovic. That was the first in a long string of short-lived memorials to the assassination. "The question you're faced with is very stark," says historian James Lyon, an expert in Balkan history. "Was Gavrilo Princip a terrorist, or was he a national hero? There have been tug-of-war interpretations, and they have changed over time." Lyon runs through about a half-dozen monuments that have been erected on this site, built up and torn down with each change in power. 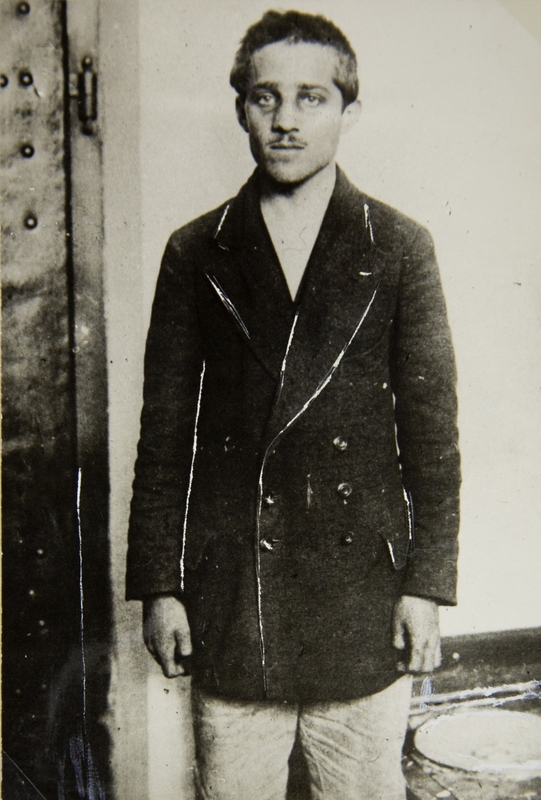 There was a plaque in the 1930s that said Princip fired shots expressing the longing of people to be free. It was removed when the Germans arrived. Then World War II ended, and a plaque went up noting that this was "where Gavrilo Princip threw off the German occupiers," says Lyon, "obviously with references to the recent war in mind." For a while, there were footprints in the sidewalk where tourists could stand in Princip's shoes. Those were torn out during the Balkan war in the 1990s. Today, a resolutely apolitical plaque stands on the corner of where the assassination took place. It reads: "From this place on 28 June 1914, Gavrilo Princip assassinated the heir to the Austro-Hungarian throne Franz Ferdinand and his wife Sofia." And this isn't the only place where the battle over Princip's legacy is raging. 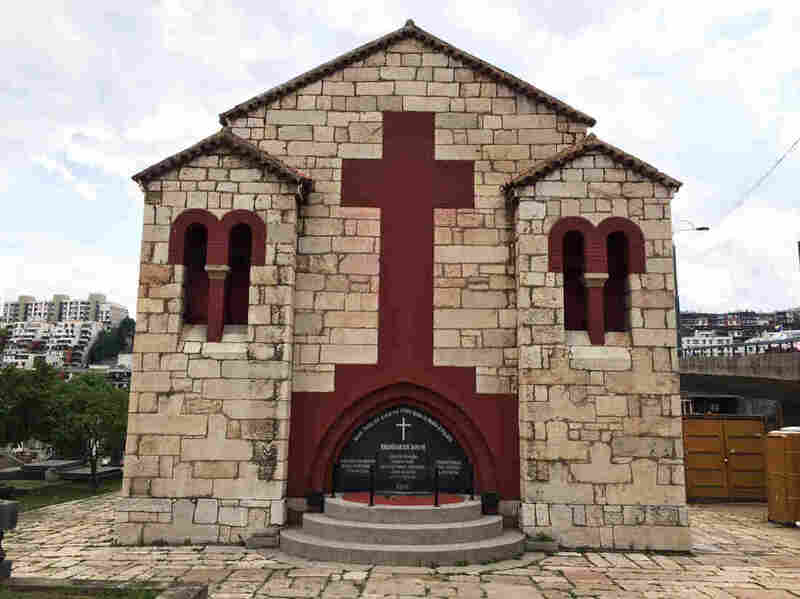 Along with his co-conspirators, Princip is buried in this chapel outside Sarajevo. The chapel includes a citation from a Montenegrin poet: "Blessed is he who lives forever. He had something to be born for." A visit to Princip's grave requires a taxi ride outside of the town center. The site doesn't look like a historic place of consequence. People sell used books outside the cemetery fence. There's a grungy cafe, and a highway overpass casts a shadow on the graves. Inside, Princip and most of his co-conspirators are buried in a small chapel. He died in prison after being convicted of the assassination. Some of the others were executed. Historian Edin Hajdarpasic of Loyola University says the inscription on the chapel refers to the assassins as heroes. "And above it is a citation from the Montenegrin poet Njegos," says Hajdarpasic. "And it reads: 'Blessed is he who lives forever. He had something to be born for.' "
Not what one would think of as the grave of a villain. Instead, says Hajdarpasic, "it has hero written all over it." In every era, people with power have tried to use this assassin as a symbol. The meaning of the symbol changes depending on who's talking. Even Hollywood got in on the act. The real Princip was a scrawny, malnourished guy. But in the 1975 movie The Day That Shook the World, he's a smoldering heartthrob who murmurs to a gorgeous woman, "Try to understand. I must do it." To people with firsthand experience of the assassination, this all seems very odd. Haaris Pasovic is a theatrical director in Sarajevo. His grandfather was a teenager working in the family shop on June 28, 1914, and actually heard the gunshots that killed Archduke Franz Ferdinand. "My grandfather mentioned that once to me in passing," says Pasovic. "The Sarajevo assassination wasn't ever the big deal in Sarajevo." Not for locals, anyway. But politicians know a powerful tool when they see one. And for the past 100 years, Gavrilo Princip has been a more potent symbol in death than he ever was in his life.